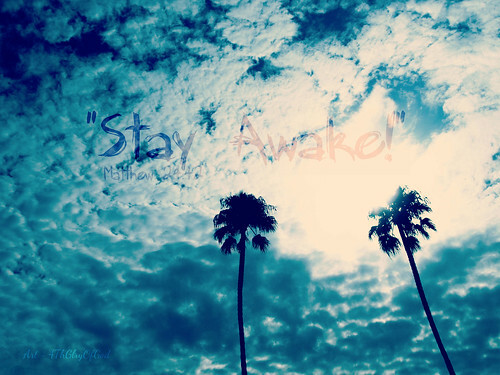 Jesus said to his disciples: "Stay awake! "The Lord Jesus calls us to be vigilant in watching for his return and to be ready to meet him when he calls us to himself. The Lord gives us his Holy Spirit so that we may have the wisdom, help, and strength we need to turn away from sin to embrace God's way of love, justice, and holiness. The Lord's warning of judgment causes dismay for those who are unprepared, but it brings joyful hope to those who eagerly wait for his return in glory. God's judgment is good news for those who are ready to meet him. Their reward is God himself, the source of all truth, beauty, goodness, love and everlasting life." Bloggers are welcome to use my artwork, please let me know in the comment section and link back to the images you use.